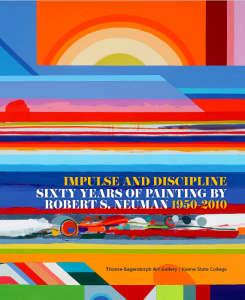 KEENE– During his lifetime, Robert S. Neuman playfully mused that the towering subjects of his Monument to One in Particular paintings [pictured left] could be erected in 3-D at such sites as the UN and Logan Airport in Boston. Now, Keene State College (KSC) Artist-in-Residence Randy Merchant is bringing Neuman’s dream to life! A student and friend of Robert S. Neuman, Randy is set to unveil his plans for an 18-ft tall sculpture inspired by the aesthetics and trenchant social critique of Robert S. Neuman’s Monuments. Join us on Thursday, March 29th at 7 p.m. at the Thorne-Sagendorph Art Gallery, Keene State College for a behind-the-scenes look at this exciting project. With this project, Randy intends to fully embrace the notion of public art. The final sculpture will be prominently displayed on KSC’s campus, and students, staff and other community members will be involved with the project every step of the way. Neuman’s Monuments series poses challenging questions about who we choose to honor in public spaces. In an increasingly globalized word where our power as citizens, consumers and creators expands every day, this question is more relevant than ever. The event will also feature KSC Artist-in-Resident Denise Dumas.